It may be a blogger's cliche to start a post like this, but as of right now, there are well over 65,000 appsin Apple's App Store. The majority of those apps? Games, not surprisingly, given the iPhone's unique, highly flexible touch interface and recently revamped hardware specs. But a new trend in the App Store has cropped up recently, seemingly having infected every one of the world's brand and marketing managers with iPhone fever. That trend is using the mobile app as a marketing tool. More specifically, using the mobile app as nothing but a marketing tool. But with an app store as large (not to mention as largely saturated) as Apple's, does it really make sense to sink valuable development hours, effort, and money into creating an app that might never break the top 100 list? We'll cover the pros and cons of entering the highly coveted app game, as well as some work-arounds developers and marketers alike can use to ensure their mobile strategy makes sense. The great thing (and one of Apple's key marketing messages) about the App Store is its diversity. With the App Store hosting everything from news aggregators to image editing utilities to to-do list managers, the development community, in just over a year, has definitely come up with some fantastic ways of harnessing the iPhone's seemingly limitless potential. 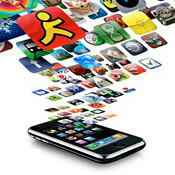 The iPhone's internet capabilities only enhance its functionality, with many apps utilizing the web to pull information. This functionality makes particular sense when a website may not be easily or entirely formatted for the mobile platform (as is the case with Facebook, eBay, WordPress, and the New York Times) or uses coding that cannot be read by the iPhone's mobile version of Safari (which is true of the Flash-heavy websites for music service Pandora and Mexican restaurant chain Chipotle). In each of these cases, developers took the iPhone's functionality and internet connectivity and developed a mobile app that not only brought functionality of their services to the iPhone users who downloaded their app, but offered a new (and some might say 'improved') way of interacting with their offerings. But imitators were soon to follow, and the iPhone's user-base was left with an a bloated and often un-navigable App Store. Sites like Google, Amazon, and Wikipedia, despite already offering optimized versions of their sites for the mobile platform, developed iPhone apps that begged the question: did we really need this? Despite negligible increases in usability and perhaps an additional feature or two, apps such as these seemed to serve the narcicistic purpose of simply stating "we have an iPhone app too!" This is where most brand managers and marketers stumble when entering the mobile space: buying into the hype that if you don't have an iPhone app, you're behind the times. While it's certainly true there is success to be found in publishing iPhone apps, those success stories don't guarantee the same results for everyone else who jumps on the bandwagon. Keep in mind, many of the App Store's download darlings are coming from established, household name brands like Google, EA, and Facebook. And let's not forget the recent statistics about app usage dropoff rates. Of course, there are plenty of examples of the big dogs' apps getting bested by tiny start-ups and single-person operations as well (remember that at one point, apps like the simple-yet-much-loved Koi Pond and the now-notorious free99-cent app iFart Mobile topped out the list of paid apps). That's another great thing about its structure: a low barrier to entry means just about anyone can develop and submit an app. But the key to successes such as these wasn't simply that the companies had an app available for download, but that they offered something unique and allowed an excited and appreciative user base to spread the word-of-mouth. So with all this in mind, what is a marketer or brand manager to do? Should you cease all efforts in app development? Absolutely not, as the mobile space is an ever-evolving digital frontier, swelling with enthusiastic support and ripe with possibility. But you may want to rethink your process a little. The first thing a developer should ask when planning for a mobile application is what do you want the user to get out of using your application? If your mind draws a blank, you should probably cease development as you are most likely developing the app equivalent of spam. If your answer offers little or no distinction against another service, website, or product you offer, you should probably tweak development, as you are most likely developing something largely redundant. Also, be sure not to neglect wider distribution channels. Unless you are developing a game, a tool that requires features specific to the iPhone (such as push notifications), or host a web service whose core functionality can only be accessed by the superior hardware of full-blown computers, there is no reason not to develop a mobile version of your site or service. Beyond the fact that mobile optimization simplifies your users' experience by taking an entire step (the much-coveted, yet tough-to-get download) out of the process, mobile optimization also extends your offerings beyond just the iPhone. While Apple's game-changing device may hold an extraordinarily high adoption rate and stand as AT&T's star player, there are many, many mobile users out there not on AT&T, but own smartphones of similar, if not equal, functionality. Remember them? Blackberry? G-1? Windows Mobile? Pre? These devices command still-admirable user bases and should not be neglected (especially as the iPhone's exclusivity with AT&T continues into next year). And as mobile carriers bring their data networks to even more markets and their smartphones become increasingly sophisticated and web-friendly, there's no reason your efforts should be entirely focused on the iPhone. As you can see, its easy to take on the mobile space smartly. You just need to rise above the hype and trend machine and bring yourself back to basics: keeping your users, customers, or clients happy. Remember this, and your mobile strategy will be much easier to tackle.